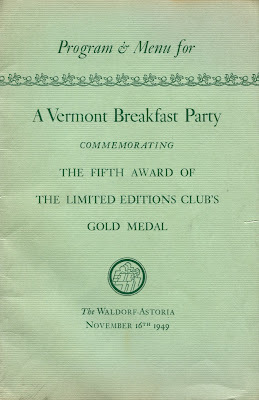 The Limited Editions Club awarded its fifth gold metal at the Waldorf-Astoria Hotel in November 1949. 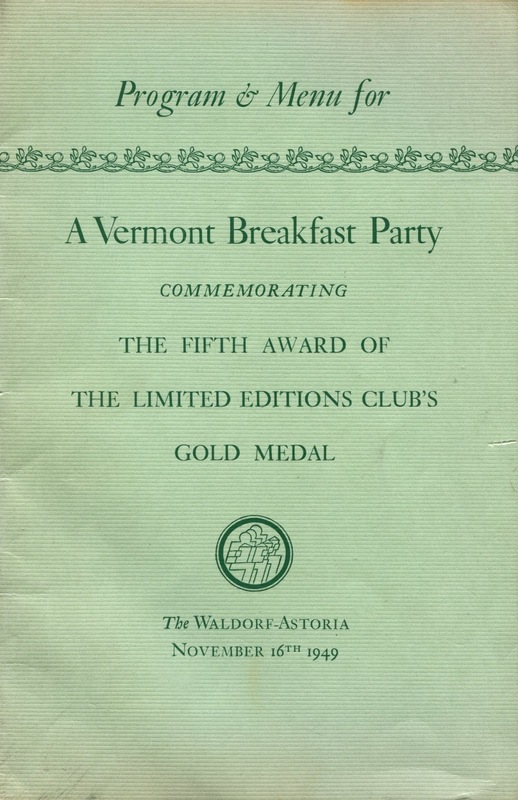 According to the rules, the award was given to an American author of a book published during the last five years that the judges believed “most likely to attain the stature of a classic.” The previous two winners were Ernest Hemingway for “For Whom the Bell Tolls” in 1941 and E. B. 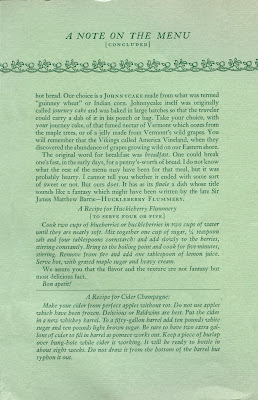 White for “One Man’s Meat” in 1944. 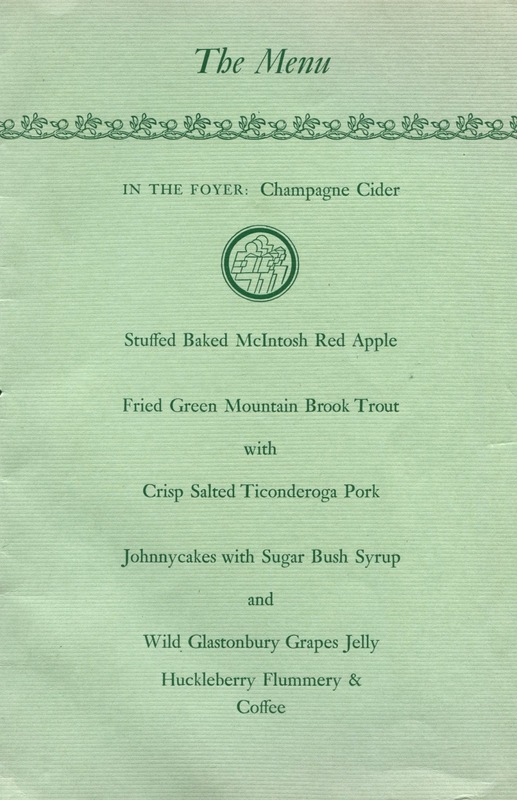 While the eight-page booklet from the presentation ceremony in 1949 does not reveal who won that year, it does contain an interesting menu from a talented writer in his own right. The menu was composed by James Beard who was then an associate editor at “Gourmet” magazine. For this special occasion, Beard also contributed an essay titled “A Note on the Menu,” explaining, for example, that the delicate trout required “no sauce; no seasoning: save the saltiness from the pork (so that one could) savor the honest, unembellished flavor.” Beard also provided recipes for the cider champagne and huckleberry flummery. 1. 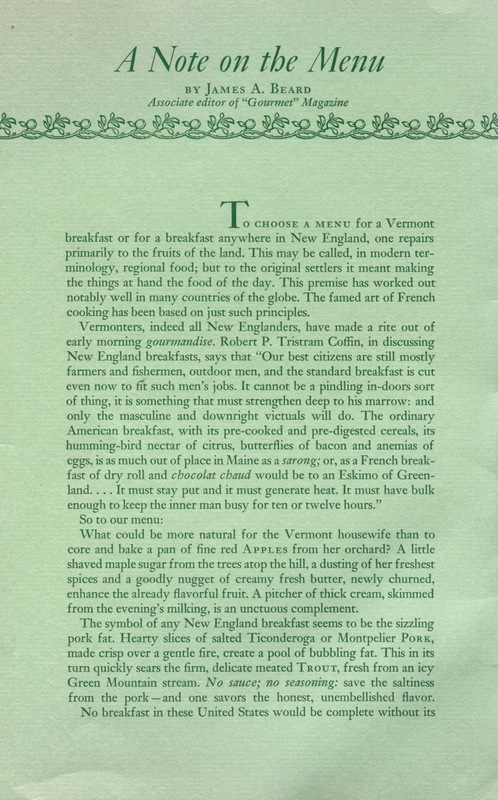 Glastenbury Mountain is located in southwest Vermont near Frost’s stone house in South Shaftsbury where he lived from 1920 to 1929. 2. As it happens, I heard Robert Frost recite “The Gift Outright” firsthand, sitting only a few feet away at John F. Kennedy’s inauguration in 1961. Henry, I so enjoy the way you add to my education with your posts and tweets. You have a way of putting your reader in the picture, at an event even before my time. 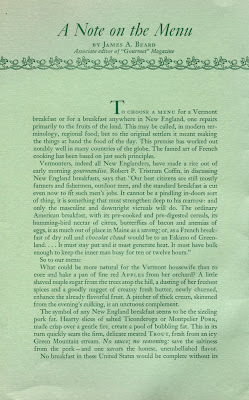 Enjoyed your Vermont Breakfast party comments. I now realize where Emily came by some of her writing talents.